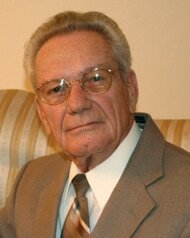 James David Beverly, 84, of Sanford, went home to be with his Lord on April 27, 2014 at Promise Hospital of Florida in Oxford, FL. He enjoyed spending time with his family, playing the piano, and making people laugh. He was born in Asco, West Virginia in 1929 and is preceded in death by his parents Nelson and Ada Beverly, and wife Anna Harrell Beverly. He was a Marine in the United States Marine Corps during the Korean War. He and his father-in-law, Samuel Alvin Harrell, co-founded Harrell & Beverly Transmissions & Auto Repair in 1952 in Bluefield, Virginia. 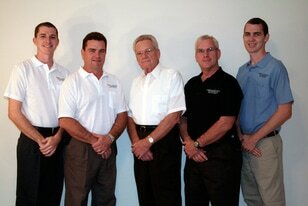 In 1959 they relocated the family business to the present day location in Sanford at 209 West 25th Street. He retired in 2006 and the family business is currently owned and operated by third and fourth generation family members. He was a member of First Baptist Church of Sanford. He served as Interim Minister of Music at Oaklawn Baptist Chapel (now Westview Baptist Church), Central Baptist Church, and First Baptist Church of Lake Mary. He is survived by his sisters, Dee Stopper (Joseph) of Fullerton, California, Hester Ann Naylor of Arlington, Virginia, and Glenna Brockman of St. George, Utah; brothers, William Doug Beverly (Janet), of Puyallup, Washington, Nelson “Sandy” Beverly (Patricia) of Premier, West Virginia. He is also survived by his sons, Alvin Beverly (Melynda) of Sanford, Donald Beverly (Hope) of Sanford, and Gary Beverly (Michele) of Sanford; grandchildren, Nelson D. Beverly (Christina) of Sanford, Tami Davis (Jake) of DeLand, Anna Pippin (Jacob) of Sanford, Lloyd L. Beverly (Angela) of Sanford, Christy Modica (Mike) of DeLand, Craig Beverly (Meghan) of Deltona, Sandy Beverly of Washington, D.C., Alex Beverly of Sanford, and Madi Beverly of Sanford. God has blessed him with 8 great-grandchildren. Visitation will be held Friday, May 2 from 6 to 8 p.m. at Oaklawn Chapel, located at 5000 County Road 46A, Sanford. A celebration of his life will be held on Saturday, May 3 at 10 a.m. at Oaklawn Chapel, located at 5000 County Road 46A, Sanford, with Reverend Dale Caldwell and Reverend Bill Coffman officiating. In lieu of flowers the family requests donations “In Memory of David Beverly” to be made to The Gideons International, P.O. Box 1056, Sanford, FL 32772-1056.